A manual for the design, installation and maintenance of soil erosion and sediment controls that fulfills the requirements of Connecticut’s Soil Erosion and Sediment Control Act (see CGS 22a-328, Connecticut General Statutes). Starting in May 2002 these guidelines replaced the 1988 guidelines on soil erosion and sediment control. The 2002 Guidelines contain information on the history of erosion and sediment control, an explanation of the erosion and sediment control process, sediment and pollution damage, how to develop an erosion and sediment control plan, details on 46 specific erosion and sediment control measures and 13 appendices including a 27×39 inch poster containing a summary of all the measures and applicability limitations. For use in the office and in the field. Hardcopies are soldout. The 2004 Connecticut Stormwater Quality Manual. This manual provides guidance on the measures necessary to protect the waters of the State of Connecticut from the adverse impacts of post-construction stormwater runoff. The guidance provided in this manual is applicable to new development, redevelopment, and upgrading existing development. The manual addresses on site planning, source control and pollution prevention, and stormwater treatment practices. Sizing criteria for structural stormwater treatment practices to meet pollutant reduction, groundwater recharge, runoff volume reduction, and peak flow control requirements is also provided as well as detailed guidance on the design, construction, and maintenance of each stormwater treatment practice discussed. Download the manual from the DEEP website (Exit CRCCD). Related resources are available at the DEEP store (Exit CRCCD). Official USDA Soils Data can be accessed and viewed online at the Web Soil Survey (Exit CRCCD). Soils Data for GIS users can be downloaded from the DEEP website (Exit CRCCD). Questions about the Soils Data should be directed to the USDA/NRCS Connecticut State Soil Scientist at 860-871-4011. The District has limited copies of the now obsolete printed County Soil Surveys of Connecticut which are for historical use only and are available for in-house review. The following are available from the District or online at no cost. May 2005. CT DEEP Wildlife Division. This list is available online from the CT DEEP Bureau of Natural Resources (Exit CRCCD). Non-Native, Invasive Organisms Create Problems in Connecticut. Native Alternatives for Invasive Ornamental Plant Species. Ed. by Timothy M. Abbey. The Connecticut Agricultural Experiment Station for the Connecticut Invasive Plant Working Group. This and related publications are available online from the The Connecticut Agricultural Experiment Station website (Exit CRCCD). Conservation practices on non-agricultural land can help increase food and shelter for birds and other wildlife, control soil erosion, reduce sediment in waterways, conserve water and improve water quality, inspire a stewardship ethic, and beautify the landscape. 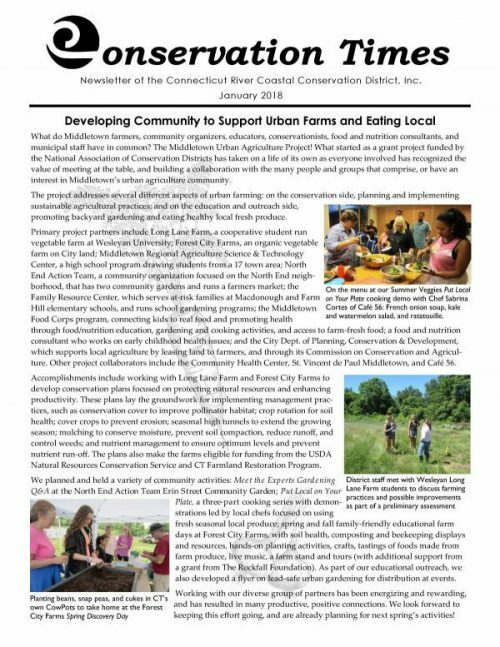 This and related publications are available online at the CT USDA-NRCS website (Exit CRCCD). The Connecticut River – Our Living Heritage. 1998. Connecticut Light and Power. Tells of the geologic and cultural history of the Connecticut River valley, the manufacturing and hydropower and concludes with tips for protecting our waters. Living Resources and Habitats of the Lower Connecticut River. Dec 2001. Ed. by Glenn D. Dreyer and Marcianna Caplis. Bulletin Number 37. The Connecticut College Arboretum. This and related publications are available online at the Connecticut College Arboretum website (Exit CRCCD). Summer 2004. Connecticut River Forum Report. A Code of Ethics for Wildlife Watching Along the Connecticut Coast. Use of Soil Maps along with Scale, Accuracy, and Map Detail. UCONN College of Natural Resources, Dept. of Plant Science, Cooperative Extension System. USDA-SCS. Agricultural Information Bulletin 513. July 1994. Compost – New Applications for an Age-Old Technology. EPA. The following can be borrowed at no cost. Long Island Sound: Worth Fighting For!